This wedding ceremony at Tacoma's historic Union Station, a train depot turned Federal courthouse, was already unusual for being on a second-floor balcony instead of at ground level like all the other wedding ceremonies we've photographed at this super-cool wedding venue. I was up on the opposite balcony for most of the ceremony, and when the groom surprised everyone (but his best man) by slapping a high-five in the middle of his first kiss with the birde! It was quite unexpected and I was happy to be in position and ready to capture it. 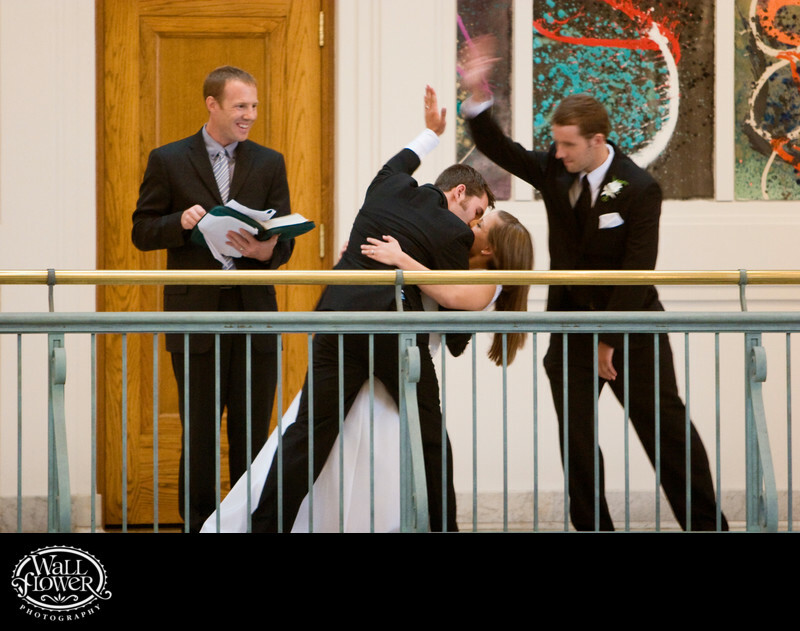 The end result is a photo that won an award in a Wedding Photojournalist Association (WPJA) competition! I love the motion blur on the best man's fast-moving hand, coupled with sharpness throughout the rest of the image.